I’m sitting with Kristen Rampe today, an expert in the soft skills of public accounting. Kristen founded Kristen Rampe Consulting, a company that elevates CPA and professional service firm practices through workshops and projects focused on the soft skills that lead to success. Kristen studied accounting in college, and she joined the Big 4 after graduation. She didn’t like the work-life balance of her public accounting job, so she took an industry position. Soon, Kristen was back into public accounting and tasked with forming a SOX compliance team from the ground up. After working with CPAs for over a decade, Kristen realized that her strengths were the soft skills that many public accountants lacked: communication, client service, building great teams, etc. Kristen embraced her strengths and started Kristen Rampe Consulting to bring these essential skills back to the industry she spent so much time inside. It’s not always easy to sell CPAs on the value of communication, especially if you are valuing communication above technical skills. While the industry tends to agree that communication is important, what’s challenging is finding the right leadership that doesn’t just say it’s important, but actually understands the value of making a conscious effort to develop communication skills. Some public accounting firms view soft skills training as a cost, but they should look at it as an investment. There is a return on that investment, and there is a distinct lack of return if you don’t make the investment. Accountants are in the people business, and the job is all about building relationships. Good communication within a team can improve work-life balance for everyone by making work a more pleasant place to be. One of the biggest communication challenges is embracing what some might call a “difficult conversation.” If someone does something that makes you mad, or underperforms, there are great ways to see these as opportunities to connect. The end result is less negativity about work, and more positivity. Separately, if there is no judgment being passed and everyone agrees about the facts, we can bring in how we are feeling in this situation. The manager in this hypothetical might be frustrated, because the manager needs to meet their deadlines and one of the manager’s needs is finishing work in a timely fashion. It’s time for accountants to get out from behind our desks. Talk to your clients, and learn more about their business. Learn all aspects of the business so that you can be their trusted business advisor, not just an accountant. 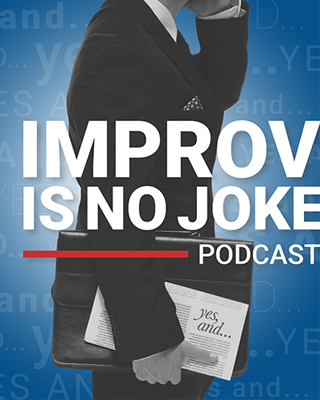 Kristen has a list of questions that you can ask your clients, some are for the partner level and some are at the staff level, that she is happy to share with the Improv is no Joke audience. Send Kristen an email if you’d like a copy of those questions. Kristen also has a wonderful book, Accounting Dreams and Delusions, which is not only helpful, but also really, really funny. I think every CPA should have a copy of it. I thank Kristen for sitting down and having this wonderful conversation with me. I greatly appreciate her taking the time to share her wisdom and insight about the soft skills of public accounting. Kristen: I thought you were going to make it easy. Tell me about myself… Well my name is Kristen Rampe, we got that covered. I’m a CPA and I live in Michigan and I went to Butler University and worked with with PricewaterhouseCoopers out of college. I quit the Big Four. I worked in industry. I went back into public at a regional firm that was out there in San Francisco, California, did that for seven more years, and then five years ago I left public for the last time. Now I have my own consulting practice where I consult with CPA firms on communication, team building, client service-type of topics. I guess to add in the more personal side, I am married and I have a pair of almost seven-year-old identical twins and one very large cat. Peter: Wow. Kristen: So yeah, that’s my status. Peter: Wow, you’ve got your hands quite full. So where in Michigan? Kristen: I’m in Grand Rapids, which is, if you can see me and I had my hand up, it’s sort of straight across from the bottom of the thumb and below the ring finger, that would be the coordinates. Peter: Got it. So you’re an accidental account as well, based on your background. Kristen: [laughs] Yes Peter: So my first question is the same question a lot of people ask me: how did you end up in accounting? Kristen: Yeah, you know I give an answer that I think many accountants do. It probably all stemmed from liking math. I did actually like math, I do like math, and I found myself in high school needing to take an extra elective, and there were only a few classes available that one would even want to take as a Senior in high school. Accounting was one, which was really bookkeeping, so I took that. I found it to be easy, because I liked math, and apparently I knew how to add by 12th grade, so that worked out really well. Peter: [Laughs] Kristen: So I did that, and then when I was looking at colleges and I ended up at Butler, because I thought their campus was particularly beautiful and appealing, and I met with an advisor. We talked about what I might major in, and he thought accounting was a good idea, and so I said, “Sure, that sounds great, let’s do it.” So that’s how it happened Peter: Wow you just kind of fell into it then, huh? Kristen: Yeah Peter: Because you know everybody thinks this is a very black and white area, accounting, when we all know it’s very gray. Kristen: mhm Peter: I don’t know if you read the book that came out a few years ago about the accounting profession, 50 Shades of Grey? Kristen: [laughs] that sounds about right. Peter: Sounds about right, yeah, I was handcuffed the whole time I was reading it. But let’s talk about accounting. My other question is: where did you gain your communication skills? Because we think of most accountants tend to be a little bit more introverted, maybe not as communicative as others, so where did you develop your skills? Kristen: Well let’s see. How did I develop my communication skills? I feel that they really blossomed throughout my career, and it was definitely working with others who sort of exhibited good skills in that area, and partly it’s a skill set that I had that I was able to put forward when I worked with clients. So I did some auditing and I did a lot of SOX compliance, and especially in my years at Frank, Riverman out in San Francisco, I just started to notice that I was really adept at working with the clients and providing great service, and then achieving great financial results as a result of that, and so I just continued to use those skills more and more, because to me they were more beneficial, not to substitute the technical. But they were the things that really differentiated happy clients and good service and great teams, and I certainly worked more on developing those skills than I did on, say, studying the deeper technical stuff, in part just because it was interesting to me. So, lots of different reasons how it came to be, I suppose. Peter: So why did you leave public? I mean, as you say, you’ve got a huge strength that is needed in public accounting, the ability to communicate, but what made you leave and start your own consulting firm? Kristen: Yeah, I left because – there were a lot of reasons that contributed to my final departure from public accounting – but the thing was that I felt that I had the strengths and I wanted to bring them to others in public accounting. I mean I certainly love the team that I worked with when I was at Frank, Riverman, and that team was undergoing some changes, which was a part of my departure too, but I thought, “Wouldn’t it be great if I could go out and work with other people, just on this, and no longer be responsible for chargeable hours on SOX compliance projects,” and so it was really looking at my own strengths and making a conscious decision to spend even more of my time working in that area, because I felt it really could be the most beneficial for me personally – working on things I want to work on – and also for others in the profession at other terms, so that was a big player in my departure Peter: Well we both share the same love of communicating and helping our profession become stronger in the communication skills, but have you found it difficult to get in front of CPA firms and sell them on this message that communication skills are important, if not more important, than technical skills? Kristen: Yeah you know what I find the most challenging is to find those that are ready to make a change, because almost everyone will agree – you know, especially leaders at CPA firms. In fact, I’m right in the middle of a series of interviews of partners with a group that I’m working with right now, and they all agree that communication is important, and it’s all over the headlines of many of the accounting news sources that it’s important, and we need to do it, and everyone agrees. What is challenging for firms is having the right leadership that’s willing to not just give that lip service. Not just say it, but to actually say this is important and I can see how making a conscious effort to work on the skills in this area will actually benefit my firm, because if they don’t see a benefit to it, and think that they’ doing alright, we’re fine, then you know there’s no reason to really make any changes or invest in, you know, people development on these skills. So that’s kind of where I see the challenge. Some firms are really on the cutting edge and they recognize it, and want to actually make improvements in that area, and some firms, they recognize it, but they think that a good place, and for those firms it’s probably not the right time to do additional work in that area. Peter: Yeah I agree, and for those firms who don’t think it’s the right time, I would say don’t drag your feet, because if you always put it off that time, one day you’re going to wake up and it might be too late because you might be gone. Kristen: Yeah, well it’s a big thing in succession planning too, because you have to consider who you can you point to that’s going to replace you, and if you have trouble pointing to somebody, or you kind of have a wavering finger pointing at somebody that you think so but you’re not quite sure, what are you doing to get that person ready and give them the skills that you’ve learned along the way, or even some of the skills you wish you had learned better, earlier? What are you doing in that area to, you know, support your future as a retired partner? Peter: Well you said one very important word in this conversation: you said for them to invest. The more that firms, the more that accounting professionals – or actually the more that anybody can look at it as an investment into the firm, into the company, versus the cost. Peter: Because with invest, there’s a return on that investment. A lot of times, with communication skills or these soft skills, they go, “What’s the return on the investment?” and I go, “What’s the return if you didn’t make the investment? Kristen: Hahaha, exactly. Peter: I applaud you. I’m giving you a standing ovation right now. [claps] Now I guess the challenge, for that individual in the firm, is how does he take that message to the more seasoned leadership that have been in the firm for a number of years? The baby boomer leadership that’s there, and have them buy in on it? Peter: Exactly. I think when it comes to technical skills you can do internal training for many people, but I think when it comes to the soft skills that you need to bring somebody in from the outside – and someone like yourself or myself – because what gives us instant credibility is the three letters behind our name. We’ve been there and done that, and we speak their language, which helps in the buy in. Kristen: Yeah, I think that is true, and the other thing is that people like you and me and other consultants, we do this for a full-time job now, as opposed to the technical side, so I think you’re absolutely right. Peter: So let’s talk about this communication and connection between team members at CPA firms. What struggles do you see? What have you run into? What are the challenges out there? Kristen: Yeah, one of the biggest challenges lies in having what a lot of people like to call “difficult conversations,” and the topics are really wide-ranging. Some topics are somewhat difficult and some are really big deals. You know, huge, difficult conversations, but a lot of people who come up in the accounting ranks generally would fall to the side of conflict avoider, as opposed to conflict lover or embracer. Kristen: And when you’ve got that as your backdrop, and it’s common, and somebody does something that makes you mad: you know they miss a deadline; they consistently underperform; you’ve tried to give them the information they need to do their job, and they’re not doing it; or, as a staff person, you’d like more experience, but the partner doesn’t seem to be receptive to your request. So that’s a particular challenge that’s hard with with team members, but the good news is there are great ways to see those opportunities, to connect, and there’s certain language that you can use to make those conversations happen, and better. The end result is that you’ll have less of that, “Ugh, I have to go to work again” or “Ugh, I have to work with that person again” and more of the kind of, “Hey, it’s a great day, I’m going to work again,” and I don’t know anyone who doesn’t want to feel better about their work. At all ranks, I hear this just as much as the at the partner level, probably even more, of wanting that work-life balance and wanting to enjoy coming to work every day, and that’s what good communication within a team can do for you. Peter: Can you give me an example of a difficult conversation? You said there’s some language there that will help in these situations. Kristen: Yeah, so let’s take a manager who has a staff person who just seems to not be getting it, or kind of always dropping the ball or underperforming, and they’ve tried different tactics to motivate them, and it just doesn’t seem to be working, and they want to sit down with that person and say, “Hey, this is a big deal, and you need to be doing things better or differently,” so there’s a framework that we can use. The first thing, and it’s big, and it takes days and days and days and months and years to really be great at it, but one of the keys is being able to separate your observations from your judgments. So being able to point to really specific, undisputable facts, rather than making generalizations. So when you say something like, “You always turn in your work late,” that contains kind of a judgment and it’s that word “always.” While it may be the case that that person has never turned in something on time, probably they have once, so you can get more specific and say, “The last four times that I asked you to do XYZ by Tuesday, you have turned it in on Wednesday.” So what it eliminates is that judgment feeling that comes through it, and everyone can sort of a agree, if those details are correct, that yeah that’s true, and and we’re not passing the judgment. Then separately, and this is how this gets into a big big big process, a big learning process, separately we can bring in how the person (the manager in this case) is feeling about that. I feel frustrated because I need you to turn these things in on time so I can meet my deadlines, because one of the needs that I have in the workplace is to be on time with my work. So there’s a whole framework that we can bring to this that makes the conversations not only easier, but they just feel better and you’re coming from a place of caring for both people, and it just brings a whole lot of goodness to those types of conversations. 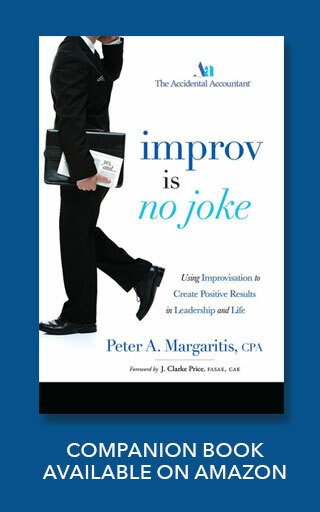 Peter: That’s some great advice, because, as you said, CPAs tend to be conflict avoidant. A lot of times, how we’ll get rid of that conflict is just avoid it, and avoid having the conversation with the individual, and maybe if I don’t address it, and just avoid it, maybe the person will just leave. Kristen: Right, right. And if how we resolve it is to avoid it, it doesn’t really end up resolving it anyway. It still sits there and it lingers, and then you feel buried under layers and layers of conflicts you’ve avoided. And this doesn’t mean you need to bring up every nitpicky detail, there’s some amount of letting things go that’s healthy also, but you have to really come to terms with letting those things go, and really let them go, and then it’s fine. But yeah, it’s good to get the air clear when it matters. Peter: And sometimes the person might not be the right fit for the job, or might not be the right fit for the organization, but I am a firm believer that we have good hires and that we should have good departures, because when the person leaves, if we’ve left on good terms and a good standing, that’s a potential referral service. Peter: I think sometimes we forget about that. That person might be able to help us down the road at some point in time, so we should have good hires and we should have good fires, let goes, whatever, and as my father always told me: don’t burn any bridges. Kristen: Right, right. Really very important. Good advice from your dad there. Kristen: [laughs[ Excellent. And and how did that first job go for you? Was it successful? Peter: It went real well. I mean, I carried files into the restroom with me. Peter: People thought that I was crazy, but I said, “Hey, I gotta work, gotta work,” but yeah that was all about the baby boomers, right? The cheeks in the seats vs productivity. Kristen: Yes, exactly. There’s a little bit of a shift these days, although I wonder what the statistic is on the number of accountants who take their smartphone into the restroom with them. I remember my boss, I would always see him walking down the hallway, just eyes on that phone, checking something out, he’d walk straight in the bathroom with it every time. It always gave me a bit of a chuckle, and I will admit I am guilty on that front too. Peter: I’m going to say 110 percent that take it. Peter: So what do you see out there in the horizon, as you look into your crystal ball from Grand Rapids? Kristen: My crystal ball from Grand Rapids, we’re really forward-thinking place out here Grand Rapids. Kristen: [laughs] No, but what I do spend time all around the the country working with different firms. You know, I see that firms are certainly – we used the word before, investing in these types of things with their people in the leadership development and recognizing the value that it adds – and I would say that the ones who are going to get the most out of it, and the ones who are going to have the best outcomes in terms of sustainability for their firm, if they would prefer to stay independent and not merge – because that’s a big deal – are the ones that… The first part is leadership buy-in and interest in it, you know. If you’ve got one person who thinks something’s a good idea but everyone else says not worth it, then you’re not going to have the competitive advantage that another firm will – one who’s got the vast majority of their leadership team on board and supporting initiatives. The firms that don’t just bring something in, a sort of a checkbox, and say, “Well, remember, we we did that one thing for one day once?” and then expect it to infiltrate and become part of your culture. You really have to have someone inside your firm leading the charge on these things, and defining what’s important for the organization and the people at that organization. And that varies, but you figure out what’s important, and having the captain, the cheerleader and the taskforce making sure that that the firm is, over a period of time, consistently bringing these values and skill sets that they have steamed into their organization. Peter: That’s great. I love that, I love that view. But as you are winding up, I started to think, what about the other side of the coin? What about the communication between CPAs and their clients? What challenges are you seeing out there? Kristen: Yeah well the first one is lack of communication. So many firms and so many practitioners, you know, you speak during tax season or during the audit period, and then its radio silent for the rest of the year. So even just having communication of any sort. I’m working with a small firm, structured more or less like a sole practitioner, but there really are sort of two seasoned leaders in that firm, and they’re right now coming up with a plan for staying in touch with the clients that they serve throughout the year. And it doesn’t mean bombarding them with an excessive amount, but I think that’s hardly the risk at most firms. But having touchpoints, you know, and figuring out when will I give them a call just to check in, or when will they send them an article that I think is interesting, or a reminder for a deadline, and making sure you’ve got those touches in. So that’s one thing. There’s also a great opportunity there for additional services, you know, and providing a bigger fee because you’re providing more service to your clients. More planning, more advising type of work, and there’s a huge opportunity for firms there in the client service area, but there’s also an angle of just being able to communicate as well with your clients as you do with your staff, and understanding their perspective and being able to bring to them the value that they need, and the relationship that they are staying with your firm for. Peter: Exactly, and I’m gonna give a shameless plug here, but I had an article published in Accounting Today that says it’s time to get out from behind our desk. Basically what I would say is to go out and learn about your clients’ businesses. Learn what they do, not just from a tax return perspective or financial statement perspective. Learn all aspects of the business so you can be their trusted business advisor, versus just perceived as the accountant. Kristen: Yeah, and more on the shameless plug side: I have a list of questions that you can ask your clients, and some of them are for more the kind of partner level, but some of them are even at the staff level. So if anybody listening to this would like a copy of that, just shoot me an email and I will get that out to you so you have a framework for that conversation, because that can help. Peter: Give me your email real quick and i’ll also put in the show notes, and in the transcript. Peter: Perfect, so hopefully your inbox will be flooded with requests for this information. As well, I will give you a not even shameless plug. This is just a plug. I loved your book: Accounting Dreams and Illusions. Kristen: Thank you, yes, I had a hood of a time creating it, so it’s definitely something that I also appreciate. Kristen: [laughs] That’s right, that’s right. Yeah, the whole book is filled with – I would sort of call them accounting memes – of things you you wish your client would say to you, but probably never would, but there’s also a chapter of things that clients wish their CPAs would say to them, but probably never will. That’s really right on the the client service provider relationship, that’s the purpose of this book and what it goes into is just, you know, why do we have these funny interplays that are highlighted in the book, and what can we learn from that too? So if you know somebody who needs a gift for their birthday and they work in the accounting world, this would be a great gift. Kristen: That’s right, that’s right. Right? Peter: Oh I read this, and I laughed out loud really, really hard, because it hit way too close to home, and it was very, very funny. Thank you for putting this book out there. I think every CPA should have a copy of it. Kristen: Absolutely, I would agree. I think it deserves a place in every office and many of the desks. Peter: Or have them send it to your clients as well, because, remember, it is a two-way street out there. Kristen: Yup, it is, absolutely. Peter: So as we’re wrapping things up, I’m starting something new, and it’s a rapid-fire session. I’m a big fan of David Feherty, watching This Morning on the Golf Channel, some old episodes, and he has his rapid-fire session, and I thought, “Wow this would be cool,” and who better to try it out on than you? Kristen: That’s right, and I’m ready. I’m prepped for this, you know? Peter: [laugs] Okay so there’s ten questions. Peter: First one: Kevin Hart or Robin Williams? Kristen: Oh my gosh, if I don’t know who Kevin Hart is, I guess I’ll pick Robin Williams. Should I know who Kevin Hart is? Who is hey? Kristen: Oh! Yeah, okay, well I’ll stick with Robin Williams. Kristen: Yeah. You know, I like him too, now that you described a little more, but yeah. Peter: Kevin Spacey or Mark Harmon? Peter: Who’s your favorite musician? Kristen: My favorite musician? Gosh, and it has to be just a single person not like a group? Peter: It can be a group. Kristen: it can be a group. That assumes I have a favorite group. [laughs] This is so hard, this is certainly not the rapid-fire you were hoping for. I’m gonna just pull one out of my, you know, my high school past, and let’s go with with U2 and Bono. Peter: Can’t go wrong with U2. Here’s a softball: what’s your favorite adult beverage? Kristen: Ooh, my favorite adult beverage. We’re gonna have to go with gin and tonic tonic. Peter: Alright, Microsoft Excel or your fingers? Kristen: Oh my favorite song probably depends on the day. There’s a song out right now that I have somewhere on my playlist, “Ain’t It Fun” by, I think it’s Paramour. I like that. Catchy, fun stuff. Peter: Is there a go-to song that you have, that when you need to get pumped up or something, that you automatically listen to that? Kristen: Yeah that might be one in the same, that same one I just mentioned, because I got that on fast repeat when I’m ready to get energized. Peter: Ok, next question: debit or credit credit? Peter: What’s your favorite movie? Kristen: We’ll go old school again: Shawshank Redemption. Peter: Love Shawshank Redemption, great movie. As it relates to toilet-paper rolls, over or under? Peter: Okay, and who’s your celebrity crush? Kristen: Oh gosh. Oh, you know that guy, I think I heard he just turned 30, that Robert Pattinson from the teen crush vampire movies, Twilight. Kristen: He’s younger than me, but that’s alright, right? Kristen: [laughs] I’m not a cougar yet, I’m not in that territory… I’m not far from that age, but, in between him and cougar. Kristen: Although I did just get called – Mark Koziel from the AICPA referred to me as an Old Maid the other day, so I want to put that out there, but I don’t really think I’m an old maid either, but it was interesting to get the label, this early in my career, yeah. Kristen: You know, I roll with it. Peter: Any last parting wisdom that you can give to my audience? Kristen: Oh boy, you know, I would say my parting wisdom – things that that make firms in CPA successful – is just keeping an eye on that, you know… be the change that you want to be. If you see something that’s not working, take the time to make the change. And it might not be today. Today maybe isn’t the right day, but don’t let yourself sit in a situation that’s not working for you. Pick up what you need to do, and go make that change. Kristen: Thank you again, sounds great. Thanks, Peter.